Located west of Phoenix, Harquahala Fire District covers 432 square miles. This coverage includes a 20-mile stretch of the I-10 Freeway. Our team is made up of 15 full-time members aided by paid on call reserves, and three administration members. 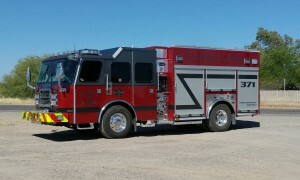 Harquahala Fire District uses a 48-hour on, 96-hour off rotation schedule with an A, B, and C shift. We are here to ensure the safety and security of those within our district. Our department handles all medical issues, fires, hazardous material incidents, vehicle extractions, and other calls for assistance as needed within our district. Additionally, the department serves as needed for backup on large incidents on the mutual aid system.